The following Statement of Faith is written using the words of the benediction given at the end of every service. I believe in God and in Jesus Christ, God’s own Son, who lives and reigns in the unity of the Holy Spirit, both now and forever. This Triune God is to be worshiped and praised in our coming in and our going out. 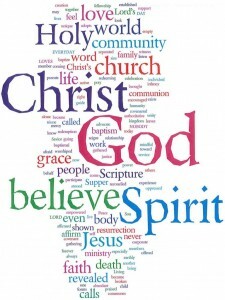 THE GRACE OF OUR LORD JESUS CHRIST-I believe that Jesus Christ is the Living Word of God. I believe that God revealed God’s self to humanity through the life, death, and resurrection of Jesus Christ. I believe Christ has atoned for our sins in his death and resurrection. Through Christ’s earthly ministry he revealed the kingdom of God and brought us into a right relationship with God. THE LOVE OF GOD-I believe that in life and in death we are never separated from God’s love. This is because of the abundant grace and mercy that God has shown us and toward all of creation through our Savior, Jesus Christ. I believe God calls all people into a life of service as shown to us in Holy Scripture. Scripture is the unique and authoritative witness to Christ and God’s word of love, grace and redemption to us. AND THE COMMUNION OF THE HOLY SPIRIT- The Holy Spirit is our advocate and our guide, through the Holy Spirit we are empowered for the work and ministry that God calls us to do. We come to know God in all God’s forms through Holy Scripture, which is revealed to us through the Spirit. THOSE WHOM WE LOVE- The church is our family in Christ and as the church we are the body of Christ. It is through our faith community that people experience Christ in the world today. In the gathering of the church community we are to listen to God’s word, to baptize and participate in the Lord’s Supper and to pray and to have fellowship with others. In the celebration of the Lord’s Supper we are to be mindful of whose body we have become members. As the gathered church communes together we are reconciled with God and with one another. AND EVEN WITH THOSE WHOM NOBODY LOVES- We live in a broken world and through baptism and communion Christ calls us to be Christ’s body for our world. I believe that Christ called us to work in the world to bring about God’s justice, especially for the oppressed. THIS DAY AND EVERY DAY- I believe that God never leaves us and that the Peace of Christ is always with us. We may feel alone or afraid in the world, but that God is with us even when we feel empty. We are a community and that even when we cannot affirm our faith for ourselves, the church exists as a community of faith to support us and affirm our faith on our behalf through the power of the Holy Spirit.